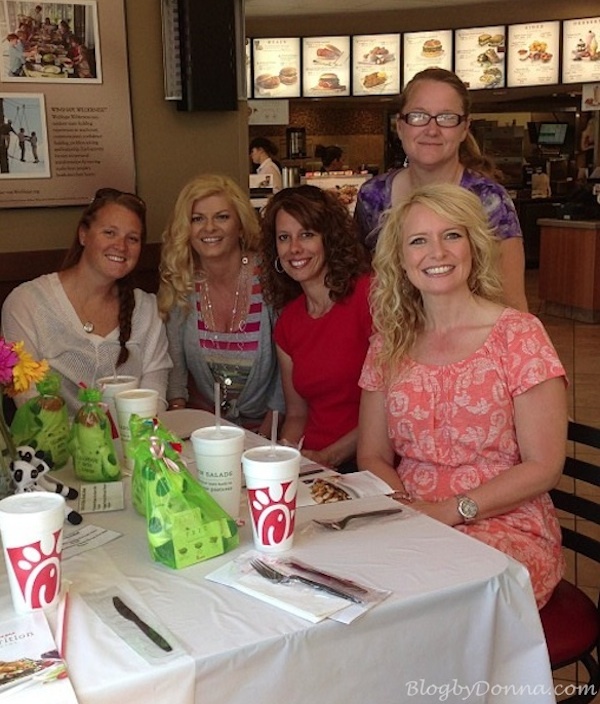 Yesterday, I hosted a salad tasting party with a few of my friends at Chick-fil-A. They are introducing three new salads and want opinions from real people, in my case, real moms, on what we think about their new #FreshMade salads. I can tell you unequivocally, they are delicious. Truly fresh made. I, along with my four guests, were very impressed with all three salads. Especially when we were informed by, Darla (the manager at the Chick-fil-A on Emory Road), that we could have any of the salads specially made. Chick-fil-A does cater to it’s customers. They want you to be happy with your food selections. The consensus was that the New Grilled Market Salad was the best. However, I think we all agreed that when we order it again, we will probably ask for hot nuggets in place of the grilled chicken. Although, we loved that with the grilled chicken, the Grilled Market Salad is only 180 calories. I know… AWESOME for those of us counting calories. Heck, at 180 calories, I could eat two of them. Just kidding. Really. Because one salad filled me up. The New Grilled Market Salad is full of freshness. Grilled and sliced chicken breast served on a fresh bed of chopped Romaine lettuce and baby greens, topped with shredded red cabbage and carrots, crumbled blue cheese and a mix of red and green apples, strawberries and blueberries. Served with Harvest Nut Granola, Roasted Nut Blend and Zesty Apple Cider Vinaigrette (or choice of dressing). The Asian Salad – Chick-fil-A Nuggets pressure cooked, sliced and served hot on a fresh bed of chopped Romaine lettuce and baby greens, topped with shredded red and green cabbage, carrots and mandarin orange segments. Served with Honey Thai Almonds, Chinese Garlic and Ginger Wontons and Honey Sesame dressing (or choice of dressing). It was a very close second for me. I mean very close. I love Asian food, and this salad was just that…. Asian-inspired. The Cobb Salad – Chick-fil-A nuggets, pressure cooked, sliced and served hot on a fresh bed of choppe Romaine lettuce and baby greens, topped with shredded red cabbage and carrots, roasted corn kernels, a blend of shredded Monterey Jack and Cheddar cheeses, crumbled bacon, diced eggs, and grape tomatoes. Served with Charred Tomato Crispy Red Bell Peppers and Avocado Lime Ranch dressing (or choice of dressing). My four friends ranked the Cobb Salad as their second choice. It was a very close third for me. Yes, I said “very close” again, because I truly loved all three salads. Depending on the mood I was in, I might want the Cobb salad over Grilled Market Salad. Know what I mean? 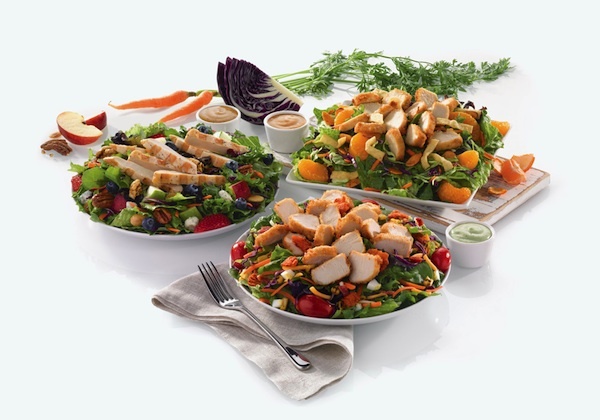 One thing is for sure, all three of the new salads at Chick-fil-A are fresh made, delicious, hearty, and good for you. Okay, that’s four things. Note: We all loved the Charred Tomato Crispy Red Bell Peppers and the Avocado Lime Ranch dressing. They could bag those Crispy Red Bell Peppers and bottle the Avocado Lime Ranch dressing and sell them as is. While at Chick-fil-A, Darla gave us a tour of the kitchen where they prepare the salads made fresh all throughout the day. Thank you to Chick-fil-A and Darla for providing us with complimentary salads and treating us so nicely. It was so much fun and they made us feel so special! A special thank you to Stacie, Darlene, Shanna, and Beth for being my guests. The food was great and the company was fab.u.lous! Disclosure: We were provided a complimentary lunch for review purposes only. No compensation was received. All opinions are 100% my own. I love Chick-fil-A and their New Grilled Market salad has my name all over it! You must, Corina! They really are so delicious! Wow, their salads really look yummy. I love Chick Fil A. In fact, we just ate there tonight. Will have to try one of these salads next time. We LOVE Chick-fil-a. I would be happy to be a taste tester! Chick fil a is one of our favorite places to eat. I’ve been meaning to try their salads, they look incredible! Your get together looks like it was fun. I wish we had a Chick-Fil-A in my area – those all look/sound so yummy. LOVE the combinations listed! I SO wish we had one here! We tried them for the first time on our last trip to Cali & have plans to stop in when we go next month! Gosh, you and your friends are beautiful. I’ve never had Chick-fil-a, but it looks good. I’ve tried two of the new salads – Yumm! Those look so good, I love seeing more and more fast food places coming out with healthier eats. I have eaten their new salads and they are AMAZING! I’ve never tried their salads. I’m too busy noshing on nuggets! I don’t have one of these near me but their food options look yummy! I can’t believe I’ve never been here before, I’ll definitely have to check them out now. I’ve never eaten there before! I’ve never tried Chick-fil-A before. I don’t think we have any in our area because I’ve never seen one, but I hear about it all the time on social media. So far I have tried the Grilled Market Salad and it was fantastic! One of the things I really miss about the States is a Chick Fil A chicken salad! I wish they had them here on base! I have never been to Chick Fil A!! Believe it or not, it’s true. But I will say after reading this post I’m looking forward to getting a few friends together for lunch soon. I will let you know how it goes, thanks!! I’m going to have to try all of these yummy sounding salads! Even though I’m a vegetarian, I must admit that I do miss their food! I might have to pop in there someday to get some of their lemonade, though. They have really good lemonade! I haven’t tried their salads, but I love their chicken and sauce. YUM! I will have to try these next time I go!